Salt Lake City celebrates May Day, despite police harassment | Fight Back! Salt Lake City, UT – Shouts of “Stand up! 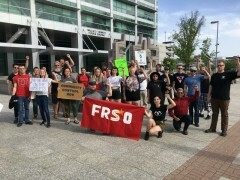 Fight back!” echoed off the buildings of downtown Salt Lake City April 28 as more than 40 people gathered to celebrate working-class victories on May Day. Groups from across the Salt Lake Valley came to participate in the event hosted by the Freedom Road Socialist Organization (FRSO), including the Rose Park Brown Berets, Students for a Democratic Society, and Utah Against Police Brutality. Before the celebration could begin, however, private security forces guarding the Wallace F. Bennett Federal Building began harassing Brown Berets organizer Anthony Fierro, who was sitting on a public bench in the shade; they claimed he had no right to sit there because the nearby building was closed. As supporters gathered to sit on the benches in solidarity with Fierro, security guards continued to harass Fierro and others while they called the Salt Lake City Police Department. SLCPD eventually arrived and ordered the rally to move off the sidewalk, though they quickly left. Despite the guards’ attempt to disrupt the proceedings, no arrests or injuries occurred, and they succeeded only in showing everyone present the importance of fighting back. It showed in stark relief that authorities don’t want to see people rallying for the working class, and they cannot abide oppressed nationalities taking up public space, much less fighting for their rights. Gabriella Killpack, a Teamster member, explained the history of May Day, also commonly known as International Worker’s Day, and its roots in remembrance of the martyrs at the Haymarket Massacre in 1886. She stressed the importance of remembering the past struggles of the working class, saying “they [the ruling class] don’t want us to know our history.” She reminded everyone of the incredible success of the working class movements: improved wages, the eight-hour workday, union power, safer working conditions and more. The overwhelming sense at the rally was that the people of Salt Lake City are tired of police violence, of the abuses of bosses and corporations, the harmful policies that school administrations push on their students, and oppressive anti-immigrant laws. Attendees left with a sense of solidarity with the working class here and abroad, and a renewed commitment to fight to end U.S. imperialism once and for all.